My phone woke me up at an unearthly 0245hrs! I remained groggy for a while, before darting out of my bed and getting ready. I checked out of the hotel at 0315hrs, and walked towards the "Central" bus station at Thampanoor, Trivandrum - it had poured down the previous night, and the road had puddles of water everywhere. The city was still fast asleep, and roads were more or less deserted, except for a few autorickshaws scouting for passengers. The bus station, on the other hand, was a beehive of activity. People occupied every possible inch of space as they waited for buses to different parts of the state. The clock ticked past 0340, and there was no sign of my bus. I was quite hungry, and decided to have a cup of tea before the bus arrives. I was alerted about the arrival of my bus through an announcement on the PA system - the time was already past 0355hrs. I saw the resplendent white swede all set to take me to Ernakulam at the platform. 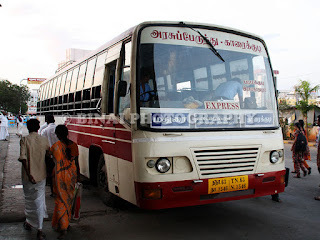 The bus, RP667 homed at Trivandrum depot, had scars all over the body. It appeared to be waging a war on the road - scratches, patch works and dents were present all around. Boarding was already in progress. The conductor did not verify my ticket - just asked my seat number and let me in. He had to finish this work soon, so that he could take in some walk-in passengers. The interiors looked quite tired - not exactly fresh as one would expect. Boarding was completed quickly, and we started off from there at 0405hrs - five minutes behind schedule. RP667 leaving from Vyttila, after I got off.. The bus stopped outside the railway station to pick two more passengers, who were running late. The driver was fast from the word go. The bus did stop time and again for pick passengers. I noted only the pick-up at Kazhakkoottam (0425hrs). I dozed off a little after this pick-up. We passed Attingal at 0442hrs. I slept quite well after that, and woke up just as the bus pulled into Kollam (0523hrs). I slept even before the bus started from Kollam. I slept undisturbed for close to an hour, and woke up just as the bus turned off the highway, to enter Kayamkulam bus station (0615 hrs). I thought the bus might stop for a break there - but that wasn't the case. It was raining quite hard there - the bus just stopped to pick-up two passengers and continued the trip. I slept for some more time. The road seemed a little rough, and it rained for most of the time. I woke up just as the bus pulled into Alappuzha bus station (0714hrs). 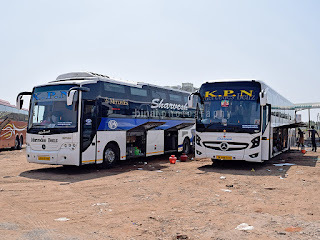 Kerala's multi-axle buses seem to have an aversion to Alappuzha bus station, and they generally pick-up passengers from the municipal bus station - and I was truly surprised when the bus went to the KSRTC bus station instead! A few passengers got off, and a similar number got in. We started off at 0718hrs. I was back to sleep - waking up just as the bus entered the four-lane road just past Cherthala. It was still raining, and traffic appeared to be on the higher side. The driver couldn't really let the beast loose - he did rip at places where he could. I slept for some more time, and woke up just as the bus passed Aroor. I reset my backrest and wanted to remain awake. We stopped at Vyttila junction (0836) to drop some passengers. Traffic was on the higher side on the road, and we made it to Vyttila Mobility Hub at 0842hrs - 12 minutes behind scheduled time. Ending Notes: The bus, RP667, KL-15-A-1630, homed at Trivandrum depot had clocked about 2.47 Lakh kms by the time of this trip. The bus appeared quite poorly kept. The bus had lots of scars and scratches all around the body. The mechanical maintenance appeared poor as well - the gear seemed to slip everytime the driver braked hard - the gear disengages and the engine raises with no power being delivered to the wheels. The crew were good - well behaved. Blankets were available on request. Water bottles weren't distributed either. The travel time was perfect - 4 hours and 37 minutes to cover a little over 220kms, on mostly two laned roads. It rained for most of the time as well. 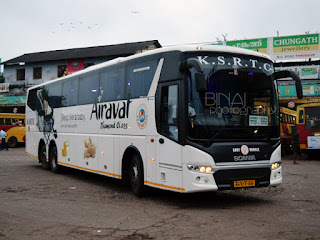 A good option to travel from Trivandrum to Ernakulam. 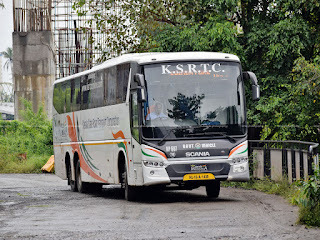 I only hope some common sense dawns on KSRTC and they come up with more such services. Will I take this service again? Its a good choice. Not too many alternatives, though.